You have survived pregnancy and childbirth and are now officially parents! Congratulations and welcome to the most challenging and rewarding years of your life! Enjoy the highlights of your baby's first year with WebMD's guide to your child's milestones. Who would have thought "sleeping like a baby" meant getting up multiple times during the night? 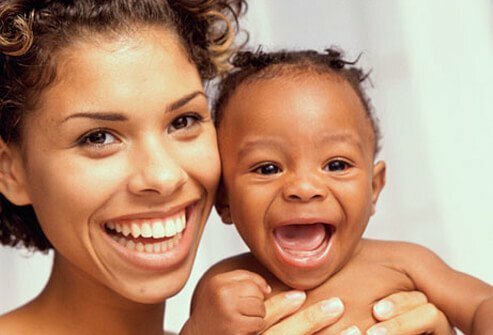 Just when you thought you would soon lose your mind, you discover your baby is a person -- at about 2 months of age, he smiles at you and coos irresistible sounds. He even seems to follow you with his eyes around the room. You can tell he recognizes your face and enjoys seeing you. By 4 months of age, your baby can help herself get over life's frustrations. 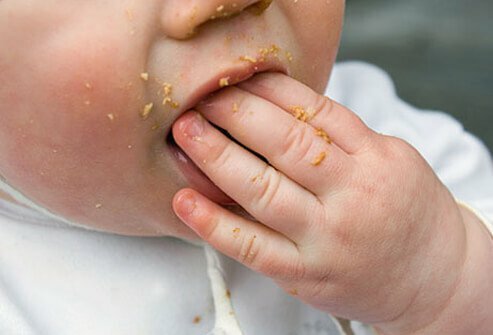 Having the capability of getting a hand to her mouth, she is magically capable of sucking on her fingers and thus promoting a self-soothing behavior. Another indication of your daughter's neurologic development is the loss of the wild and jerky arm and leg movements that characterized the first few months. Her laughter and squeals are infectious, and she is a happy 4-month-old. 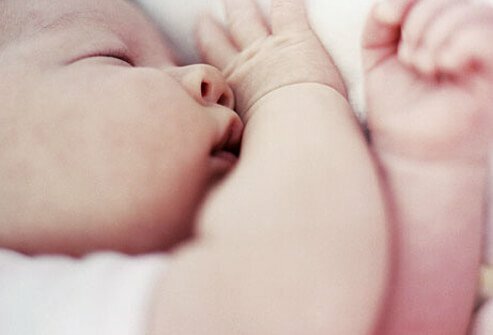 By 5 to 6 months of age, most infant's brain maturity enables a continuous night of restful sleep. You can have a life again! In addition, a daytime nap schedule is usually established by this time. Once again, you can schedule your time (sort of). For a 6-month-old baby, being vertical is necessary. The life of looking at the ceiling from a supine position is very boring, but looking horizontally opens up a world of interesting people and objects. 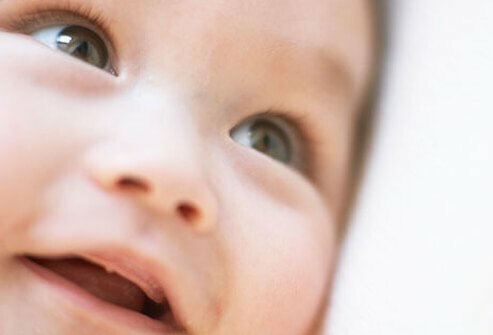 Hand-eye-mouth coordination enables a baby to learn about objects by both tactile and oral sensations. Everything must go into the mouth! Children learn to sit independently between 6 to 8 months of age. 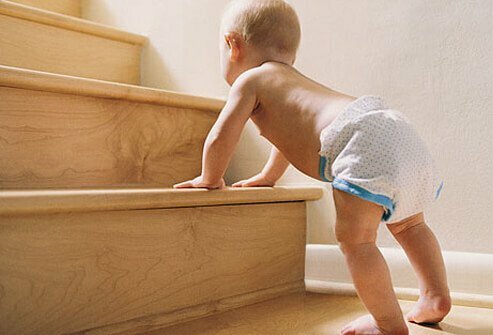 Within four to six weeks of sitting independently, many babies are crawling everywhere. The drive to get from point A to point B is very strong but has a built-in emotional struggle: "It is fine for me to crawl away from you; it is not OK for you to walk away from me since I have tremendous separation anxiety." It is not essential an infant crawl on their hands and knees; "combat crawling" (on the belly like a soldier going under barbed wire) is a normal variant. Safety proofing the house is a must since babies will crawl to an object and want to put it into their mouth. They are also exceptionally skilled at finding hidden objects under sofas. Language acquisition is a critical element in a child's development. The random squeals and various noises slowly evolve into repetitive undulations and then sounds. Many are meaningless, but over time a baby discovers that "ma, ma, ma, ma" and "da, da, da, da" always get a much better adult response than "za, za, za, za." Likewise, hand gestures such as waving "bye-bye" become associated with predicable behavior (parents leaving) and may lead to frustration. By 9 months of age, most children have an ability to pick up the tiniest object and rapidly put it into their mouth. Home and environmental safety is a must. However, the ability to pick up such objects also heralds the neurologic developmental readiness to learn to chew. Suddenly, the baby spoon is rejected and finger foods are all the rage. 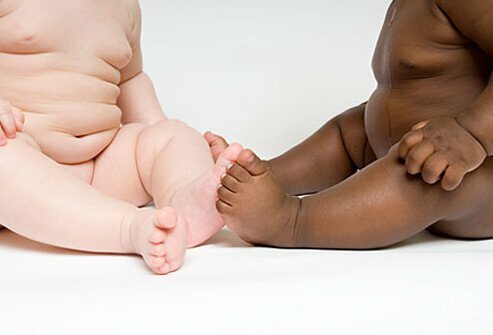 Unfortunately, infants also discover that gravity works every time they drop food onto the floor, which can be truly amazing from their perspective. 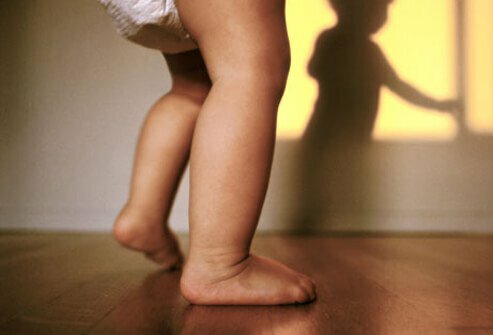 Generally, infants learn to walk independently between 9-16 months of age. However, many weeks of mastering the art of pulling to a stand and sitting again in a controlled fashion are a must. After this accomplishment comes the ability to "cruise" -- going sideways in a crablike fashion along the length of the family couch. The final process to be mastered enables the infant to reach and traverse from one piece of furniture to another. The final process of walking is often felt to be more psychological than physical. Many infants will walk all over the house with the minimal reassurance of holding a parent's finger. Remove that crutch and the baby will just sit and often cry in frustration. Extend your finger and the tears stop instantly. 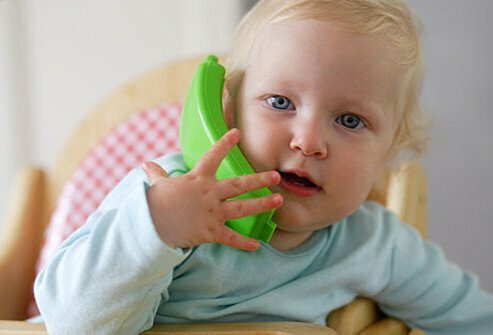 By the time your child is ready to celebrate their first year on planet Earth, they will commonly have established the basics of receptive and expressive language skills. Calling their name, saying "no," or pointing to a familiar object or person truly is understood. You can see it in their eyes. Reciprocally, "mama" and "dada" truly mean you! Your baby is growing up! Brazelton, T. Berry and Sparrow, Joshua: "Touchpoints"